The Villanova University men’s basketball team run in the NCAA tournament was short lived after a loss to No. 3 Purdue University. This came as a surprise, as they are the reigning champions from 2018. (Photograph courtesy of Maddie Meyer/Getty Images/TNS). With such big upsets in last year’s tournament, such as the victory from No. 16 University of Maryland Baltimore County over No. 1 University of Virginia in the first round, the hype for this year’s tournament was through the roof. Although something that surprising didn’t happen, there were some amazing wins from lower ranked teams. The first round brought a couple wins from low ranked teams. No. 12 Liberty University had a surprising win over No. 5 Mississippi State University. Both teams were close the entire game, Mississippi State pulling up to a 37-35 lead at halftime. After the half, Mississippi State kept a strong lead, scoring 10 points up to the final seven minutes. However, that didn’t stop the Flames. Liberty rallied in the last few minutes of the game to get a 80-76 win over Mississippi State. This was a big victory for Liberty, given their previous four appearances were losses as the No. 16 seed. They didn’t have as much luck in the next round, as they lost to No. 4 Virginia Polytechnic Institute and State University, but it was a great step in the right direction. Other notable wins by lower ranked teams include a first round win by Murray State University led by sophomore guard Ja Morant. Making the Top 101 players of the 2018-2019 season, Morant made the news as the tournament got closer and closer, as he made monstrous dunks against big teams such as Auburn University and the University of Alabama, showing just how powerful he and the team could be in the tournament. When March rolled around, there was so much hype for Murray State that it seemed like they could win against their first opponent, No. 5 Marquette University, and they weren’t wrong. Morant ended up getting a triple-double in the game, the ninth triple-double to happen in the tournament’s history since 1987, when the NCAA started keeping track of them. Murray State dominated in every way, outscoring Marquette in both halves, which led to their monstrous 83-64 win. More upsets came from University of California Irvine Aggies and University of Oregon Ducks. The Irvine Aggies’ 70-64 win over Kansas State University was their first tournament win ever. They lost their previous appearance in 2015 when they fell to the University of Louisville 57-55. A slow start to the season for Oregon threatened their tournament chances, but a strong comeback late in the season got them the win. The Ducks used this momentum to shock the University of Wisconsin when they won by a whopping 18 points, finishing the game 72-54. Some of the biggest upsets came in the later rounds when big names in the NCAA tournament lost, such as Duke University, the University of North Carolina at Chapel Hill and Villanova University. Duke, led by freshman Zion Williamson, was a favorite to win the tournament but lost by one point in the third round to Michigan State University. This was Williamson’s time to shine, as this tournament would be the end of his college career before his predicted move to the NBA. Reigning 2018 national champ and No. 6 Villanova had a surprisingly early exit this year. They coasted by with a first round 61-57 win over Saint Mary’s College but struggled as they faced No. 3 Purdue University. 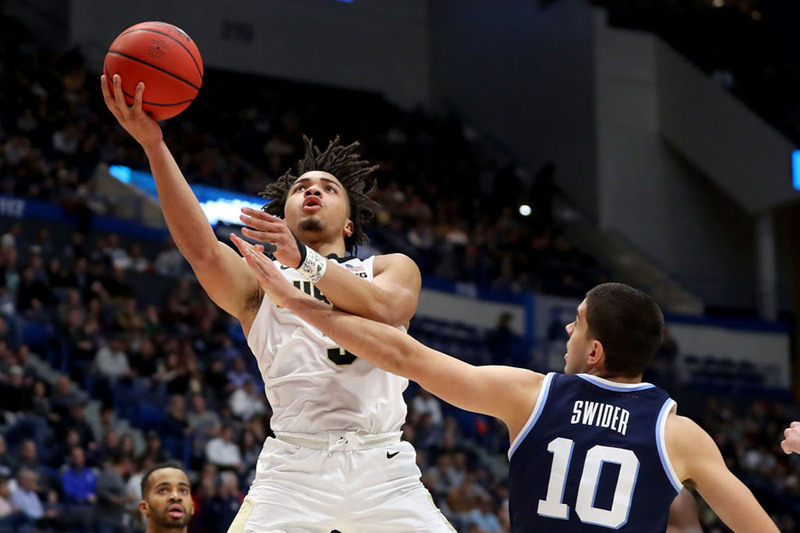 Shooting only 34 percent compared to Purdue’s 54 percent, Villanova had a hard time coming back from deficits in each half and ended up losing 87-61. UNC started off well with wins in the first and second rounds over Iona University and University of Washington. Later, the UNC Tarheels faced tough competition from No. 5 Auburn, as they outscored UNC by two points in the first half. Still, UNC was determined to win, but Auburn had other plans. They went to outscore UNC by 15 points to win 97-80. This was their first trip to the Elite Eight in 33 years, while UNC was forced to go home after becoming a staple in the tournament for years. Although the tournament did not have No. 16 seeds defeating No. 1 seeds, this year brought great games to college basketball’s most popular month.